(friends and family) "havent you covered that already?" (fellow bloggy buddies) "Oh joy, another one..."
Well really, if you'd care to check out the amazing goodies up for grabs in VeryBerryHandmade's supadupa giveaway bonanza... d'you blame me?! 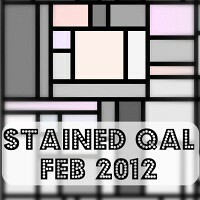 In January 2011 I posted this list of goals for the years sewing. Giles, click here for blogpost with written list! I got some practice anyway! I'm certainly not a FM quilter yet, but I did a 20" cushion, an 18" cushion, and I did a 10" border around the edge of a quilt. Yes, its a border cos I chickened out of trying to manhandle the quilt any further... But its a start innit? Fail. Non starter. Total wimp out. Bought some voile, and its pretty, but its slippy too.. I did!! I made 4 quilts that I sat and designed myself, worked all the sizes and quantities out myself, and put together without instructions. They are maybe not the most inventive quilts in the universe but I'm more than happy with that one :-) Owly quilt, Dorothy, Not-so-hidden stars and Staind pink. Ahh. Well, technically speaking I didnt have enough scraps to make much of anything so I think I'll let myself off that one. I had a go a dying fabric, I did 3 prints for my bee quilt. And some towels. (and my nasal passages)...I didnt quite get round to the bleaching fabric, but I do now bleach my tea towels...can that count? I didnt really did I? In fact, I dont think I really tried any new bag patterns. I did, however, learn the whole lined pouch and lined drawstring bag down to a tee, so that's better than nothing right? Ah. Bit sorry I didnt get this one done, I really should. Must try harder. I practised. I feel I improved slightly. I didnt honestly do enough of it to improve by any kind of noticeable leaps and bounds... but that wasnt the resolution was it! So that was 2011, and this post is meant to be 2012. I'm getting to it, honest. There were some ideas I had for last year that I think really need to be carried through to this year too. 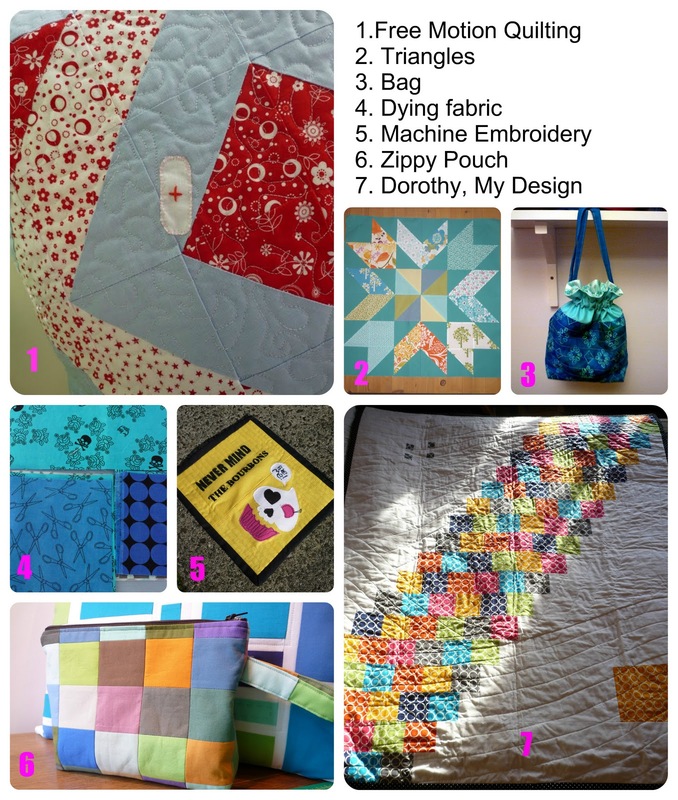 I still need to practice and improve on many things, not just FMQ and zippers... I'd like to get the nerve to do a quilt top in voiles. I'd like to make more of an effort to do more bags, especially in my wool bits. And I'd love to tackle something bigger I'd be rather pleased with myself if I managed to tackle something bigger than 45 x 60". In 2012 I am going to try to NOT buy nearly so much fabric, and more importantly, to stop staring at and stroking the fabric I've got and cut the damn stuff up a bit so I can use it! You've been a busy girl. How could you possibly attempt number 13? I think you should rest up with a cuppa, a piece of cake, and go fabric shopping...! I think you can feel pretty smug! And why reduce the fabric purchases? What is there better to spend your money on? Plus you're still saving all that money from not smoking! You've done really well with last year's goals and I can't wait to see how you do this year, I'm particularly looking forward to seeing the woolly bits bags! Ok, this is howlingly funny! Good going--you got through tons, very impressive. Wish I could say the same! Oooh, can't wait to see what you and your mum have been up to! PS your HSTs are great, you divvy! I think you are doing great, that was a long list! I love that Dorothy quilt. Have finally managed to comment on your blog after installing google Chrome, there's an issue with blogger and embedded comments which means I couldn't using my normal browser :( Anway, I have to tell you that number 6 totally cracked me up, and that I can help you with number 11 if you'd like...since I tried piping quite recently and I think I'm a convert!